The ace up the Germans' sleeve was the new Walther propulsion system, which promised to revolutionise submarine warfare. This was basically a closed cycle steam turbine, which burned an oxidant with oil fuel to dispense with atmospheric oxygen. The Walther system used a concentrated form of hydrogen peroxide known as Perhydrol which decomposed and was burnt with the oil fuel to produce a mixture of gas and steam which drove the turbine. It offered far more power than electric propulsion, and promised underwater speeds in excess of 25 knots. The first Walther turbine had been tested in an experimental submarine as far back as 1940, but the first production U-Boat to receive it was U791. She was not commissioned, but experience with her was incorporated into the Type XVIIA U-Boats, which were coastal submarines powered by two Walther turbines coupled to a single shaft, and capable of about 25 knots. Under considerable pressure from U-Boat Command, the designers produced drawings for improved types, the XVIIB and XVIIG, but to speed construction only one of the turbines was installed. Despite this a speed of 20 knots was attained, more than double that of the conventional Type VII and Type IX U-Boats in service. There were many drawbacks, however, and the Walther submarine must rank with some of Hitler's more bizarre tank projects as an interesting idea which absorbed far too much material and time at the expense of less ambitious projects which were suffering setbacks. The chief difficulty was in the manufacture and storage of the fuel, known as "Ingolin". This was highly unstable, and any impurity in the storage tanks led to decomposition and spontaneous combustion; only clinical sterility would do, and eventually synthetic rubber was discovered to be the least dangerous material for lining the tanks. Ingolin was also very expensive to make, costing about eight times as much as oil, and was consumed at a prodigious rate, so that a Type XVIIA boat could only travel 80 miles at top speed - which put the clock back to about 1900 as far as operational radius was concerned. These problems were realised by Dönitz, and at a conference with Hitler in July 1943 he mentioned the existence of a new interim design known as the "Electro" submarine, which was to bridge the gap between the ordinary schnorchel-equipped U-Boats and the first Type XVII boats. 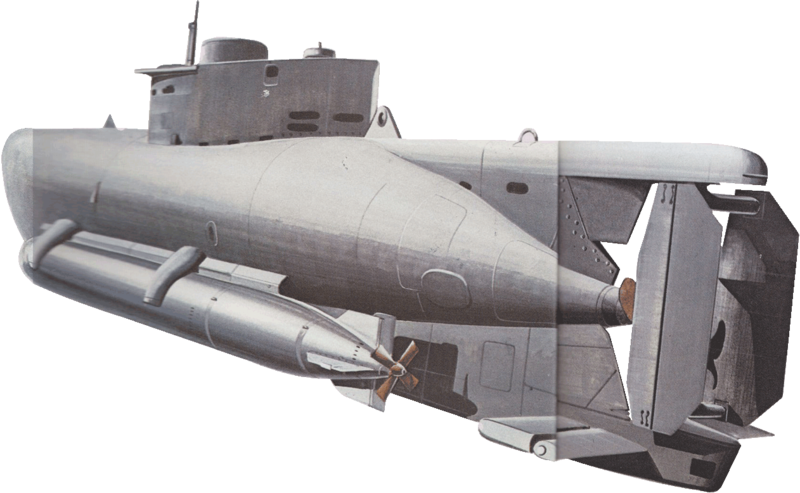 This was the famous Type XXI, actually a conventionally- propelled submarine, but redesigned to make use of every possible advance to offset the recent Allied successes. The improvements can be summarised as basically a streamlined hull to reduce underwater drag, and enlarged battery-capacity to give higher underwater speed. Had the Type XXI been available in greater numbers in 1944 U-Boats might have made a comeback and inflicted casualties at the 1942 level. To boost the underwater speed from 9 knots to 15t knots it was necessary to treble the battery capacity, but they were also fitted with silent auxiliary motors for "creeping" at 5 knots. To allow attacks from safer distances the torpedo salvo was increased to six tubes, and 17 reloads were carried. Wartime experience showed that a torpedo-tube took at least 10 minutes to reload by hand, so the Type XXIs were given mechanical loading to reduce the strain on the crew and to give them the chance to follow up an attack quickly. Although the conventional conning tower had given way to a streamlined "fin", the menace of aircraft called .for two pairs of AA guns in remotely controlled positions on top of the fin. Dönitz promised Hitler that the first Type XXI U-Boat would be ready in November 1944, but Hitler immediately demanded that the Konstruktion-Amt should do better, even if it meant three-shift working. Reichs-minister Albert Speer was given the job of organising the mass-production of Type XXIs, and he hoped to produce 20 per month. But in that strange mixture of efficiency and muddle which characterised the war effort of the Third Reich, the obsolescent Type VIIC was allowed to continue in production, while the Type XXI was entrusted to "diluted" labour, i.e. a small proportion of skilled workmen padded out with old Mien, women and even children. The territorial ambitions of the Germans now proved their undoing. The Army's need for manpower and the aircraft industry's over-riding demands for strategic materials meant that even if the U-Boat programme had been completed it was unlikely that the boats could have been manned. Dönitz told Hitler that in the second half of 1943 production would be running at 27 U-Boats per month, and it was hoped to increase this to 30 per month by 1945. But the existing programme was using 6,000 tons of steel each month, 4,500 tons for U-Boat hulls and 1,500 tons for torpedoes. He also pointed out that if production rose to 40 U-Boats per month extra personnel would have to be found. The Kriegsmarine's allowance was 102,984 men, and the estimated manpower requirement was already 334,838 men short.